An excellent way to flex your game design muscle is to take on a mini design challenge, like a game jam, the One Page Dungeon Contest, the 1KM1KT 24 Hour RPG Contest (if it ever gets going again), or the 200 Word RPG Challenge (due May 28!). Even if you’re not into table-top RPGs, you can learn a lot from mini challenges like these. It’s often said that limitations encourage innovation, and that’s exactly the point of these challenges. Claustrophobia was born out of the 24 Hour RPG Challenge. A bunch of our products built on work I did for various challenges. Claustrophobia was born out of the 24 Hour RPG Challenge and Lunatic Labyrinth built on the shifting dungeon I created for the One Page Dungeon Contest. Those mechanics also influenced David N. Ross’s design for Forests of Secrets, making the adventure infinitely replayable. You can find the Secret Forest map here. But enough product placement. How about some real tips? There are some (legal) things you can do to improve your chances of winning a contest. These steps will also help you be a better designer, and are based off lessons I’ve learned through various contests and as a freelance writer for other RPG publishers. Read the Brief. Then read it again. When you’re done, read that bad boy one more time. Make sure you’re presenting something the judges want to see. Be Innovative. Create something new and interesting that makes the judges go “hey look, this is cool.” A sense of wonder can be hard to achieve, but look to explore new ground. Make Fun. Look at your games collection. There probably isn’t anything boring there, but there are bound to be games that stand out as more fun than the rest. Deciding if a game is fun or not is subjective, but a good place to start is by asking “What’s fun for me.” Build that. Go out, flex your game design muscle, and have fun. Good luck out there. Write – Design – Program is a series of game design, writing, and programming articles that includes interviews, insights, and tips. If you enjoyed this post, please consider sharing it. A big part of good design is simplification. I often rewrite rules text, fiction, or code, and the rewrite almost always ends up a lot simpler than the first draft. Version two is often more intuitive, which is a big part of why simplification is important. If something’s too complicated, it’s hard to wrap your head around and more likely to break down. While wearing this mask you gain a +20 ft. bonus to your speed while taking the Dash action. This bonus is doubled along with your speed as part of the Dash action, effectively giving you a +40 ft. bonus to your speed while using the Dash action only. When you take the Dash action while wearing this mask your speed is 50 feet. In game writing, writing in general, and in coding, the simplest solution is always the best. In practice, it might take several attempts to find the most elegant option, which is why rewriting or refactoring is so important — it’s what makes “good enough” better. The more time you put into simplifying your work, the more it will shine. King writes that this simple formula had a big impact on his writing and was at least partly responsible for his success. It’s not only that the formula reduces word count, but that it forces you to chuck the unnecessary baggage your story is lugging around. Design Question: How can I simplify. A lot of you may be following the Pathfinder 2 Playtest. If you have you’ll likely have noticed how Paizo has gone out of their way to make Pathfinder 2 simpler yet still as deep as its predecessor. Pathfinder 2 is essentially the same game refined through a process of simplification. The end result can be seen in mechanics like the streamlined action system and their more intuitive encumbrance system. If you’re a game designer, you probably do this anyway, but next time you play a digital game, take a hard look at the menu system and the graphic user interface (GUI). Great pains are taken to keep the GUI intuitive. Explore the GUI of your favorite games and find what works, what doesn’t, and how the designers have attempted to simplify things. Till next time, simplify your design and Make Good Games! Running a con stall makes sense if it’s right for your business. In this Write – Design – Program post we look at the business of RPG Publishing and how to best sell your books and games at a geek or gaming convention. 2018 is in full swing, and the big geek and gaming cons draw rapidly closer. It’s decision time; do I run a stall this year, or let some great opportunities sail by? Being visible at some of the major local conventions could be a big game changer for my fledgeling business. But it could also be disastrous? Prepare yourself for some doom and gloom. Intelligent publishers plan their con involvement wisely. I do a fair bit of freelancing in the gaming industry, and, although most of it is in table-top roleplaying, I’ve also worked with digital game publishers. No matter what type of games the publisher is involved with, they choose which cons will give them the best bang for their buck. Sometimes, this means they don’t have a convention presence at all. The thing is, if a 3 x 3-meter stall at a con costs $215 for the weekend, then you have to ensure you fill it with enough merchandise to cover the vendor free, plus all the other expenses you’ll incur. Although I work closely with several people, I’m practically the only staff member I have available. I would need to hire someone for the weekend or beg a friend to help. I sell digital books, so I’d need to either fork out cash to print up stock or devise some clever way of selling digital products at a convention that may or may not supply WiFi to its vendors. Either way, I’d need plenty of products to ensure I end up in the black. I have no buffer if things don’t work out. Anything I put into the stall needs to work, repeatedly, for any other con I attend. I make very little money from local sales, and I don’t suspect that a con would change that. Most role-players don’t attend cons. Of the three groups I play in, only four other people attended the biggest local con last year. That’s about one-quarter of the players. A very small fraction of role-players play at cons. Over two days I played one small demo game, with players who now play in my Monday night Stranger Things campaign. The Pathfinder Society game I prepped never had any players sign up and general morning game attendance was poor. But, okay, that was one convention. Con players are a staunch group of die-hards. After five years in Japan, I was surprised to see the same faces, without much new blood at the tables. Don’t get me wrong, many of those die-hards are my friends, but maybe we need to do more to encourage new players. South Africans don’t have money. Okay, I’ll admit, a big generalization. 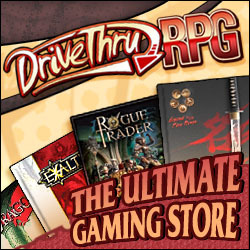 But the Rand/Dollar exchange rate is only just improving, and high shipping rates mean that POD from sites like Drive Thru RPG is unfeasibly costly. Running a demo at a con seems like a great way to sell to the people who matter; those players who’ll go back to their group and evangelize your offering. Besides the networking opportunities, it’s a great chance to improve your pitch and get some game testing in. GMs are always needed, so it’s likely that you can run your game without having to pay for a table. It struck me, while writing this post, that the best option is the one most publishers use: shelf space. There’s probably an industry term for it, but having other vendors sell your books is ideal. If I can put 2–3 copies of my best books in the hands of vendors, and have them sell them, I can limit my risk, reach customers, and test the market. And the best part? I can action both options at the same time, and each option has the potential to benefit the other. Win-win. July 25th, 2017, marked a year since I finished 5 years of teaching in Japan and began working full-time in the games industry. That’s 1 year in games! It’s been an up and down ride, but I’ve learned so much. Here are some of my reflections. In 2011 my wife and I left for Japan. I didn’t like the route my career was taking—working predominantly in web design. I felt I could do more elsewhere, and wanted out. Five years later I walked out of the classroom and into the games industry. I started Rising Phoenix Games on the last day of 2010. Over the next five years, in my free moments, I worked hard to learn my craft and build the company. When I realized there was only so much I could learn on my own I started freelancing, which taught me loads more, but also brought new opportunities my way. None of that would have been possible without the five plus years of banging on my craft. Starting and starting early was critical. Jake Birkett (Grey Alien Games) mentions this principle in his GDC talk, How to Survive in Gamedev for Eleven Years Without a Hit. A runway—or savings—helps you weather the time between project launches. I’m not a big drinker, never smoked, and love a bargain, so was able to step away from my last job with enough money to see me through till sales came in. There were sleepless nights, but it really helped. I still relish the opportunity to save, and am busy installing a rain water tank to cut down on our utility bill. More Money Saved = More Money for Game Dev. We had this slogan at the summer camp I worked at: “TEAM: Together Everyone Achieves More.” Cheesy, but true. Partnering up has, in every instance, taken me further than I could have gone by myself. Because of this, being a team player is important. Time is short, and people want to work with someone they know has their back and will deliver. I aim to stay in the games industry, one, five, ten years and longer. Write – Design – Program is part of that, because this series is all about sharing insights. If you’re working in games, tell us what’s working for you. Rodney Sloan is a game design, writer, and programmer at Rising Phoenix Games, a line developer for Steampunk Musha at Fat Goblin Games, and a freelancer. You can find him on Twitter. You pass the stone gateway into the dungeon. Rounding the first turn, you come face to snout with a giant rat. In most RPGs, digital or table-top, an encounter with a giant rat or three is a pretty standard introduction to combat. Remember Fallout? I don’t have anything against giant rats, I’ve used them, but good design happens when there’s a why. Fallout again. Those giant rats were the neon sign, reminding you why Vault 13 was such a great place to live through a nuclear holocaust. One of my favorite movies is Hot Fuzz, written by Edgar Wright and Simon Pegg. Everything in the movie has a reason, everything is connected, and nothing is wasted. That’s great design. Good adventure design, good game design, uses every opportunity to tell a bigger story. Love game design? Subscribe for the latest tips and tricks from Write – Design – Program.